It was an exciting moment. After a year of development, they were finally going to release their secret project online. Aaron Stanton and his team had been up 26 hours, according to a Boise newspaper, "broken only by a 4 a.m. trip to WinCo for more Red Bull energy drink." Aaron had already made headlines when he flew to Google's headquarters last year without an appointment, vowing he'd wait in their lobby until they heard him out. He wasn't allowed to camp in the lobby, but eventually he got his meeting and began cobbling together a prototype. Now Google, Yahoo, and Amazon have all peered at Aaron's big idea, and last week Boise's 26-year-old entrepreneur finally revealed it to the world. Unfortunately, a year ago the world had already guessed Aaron's secret. Or at least, some commenters on Digg deduced that it was related to "the Novel Project," Aaron's abandoned venture from 2002. His newest version also analyzes books. But instead of delivering book-writing suggestions to authors, it delivers book-buying suggestions to readers. (Aaron calls it "a Pandora.com for books.") In a December interview, Aaron told us he felt big companies would be more willing to listen to him now that he had something to show them. He'd already begun filing a patent, and "I still get e-mails on a regular basis wishing me luck." But has he already received a rejection from Google? When we contacted Aaron twice last week with that question — we received no reply. Aaron's latest video announces instead that "This isn't just about Google any more. It's also about Yahoo, who reached out to us early in this adventure." So how did it go at Yahoo? "It was bad timing," Aaron later told Wired News. "We got down [to Silicon Valley], and two days later they had a bunch of layoffs." He's also added more big names to his list of potential partners. "It's also about Microsoft and Amazon.com," he hedges in the video, saying they complete the list of "the four companies that we think are in the best position to look at what we're doing and say okay, that's genuinely pretty cool." But of course that depends on what "being about Microsoft" means. "If you happen to work at either one of those two companies and you see this, would you pass this on?" Aaron asks hopefully. "Because we have something we'd like to say to you." "We do actually own 'Can Amazon Hear Me .com'," he says in the video, "but at this point (he smiles) that seems a little cliche." 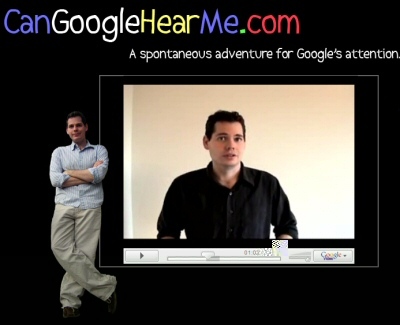 Aaron rose to fame with an online video blog chronicling his quest to get that first meeting with Google — called "Can Google Hear Me?" But his enthusiastic updates had always adopted a fierce silence about one topic: his secret entrepreneurial project. Last week that mystery finally ended with the beta release of BookLamp. Here's how it works. When a user pick a book, Aaron's system quickly "reads" it — every page — and calculates a score based on five criteria. (Its pace, the level of dialog and action, the amount of description and the density of its prose.) A slick interface then generates a graph showing how the book scored, page by page, on each criteria — and identifies other books with a similar profile. In the next version, his interface will even let users adjust the algorithm themselves, and it may even become a self-learning system. (For example, it might tweak its scoring based on patterns like recurring "theme" words that the user may not even be aware of.) "The idea is that over time the system will be able to recommend books on data that you yourself would never think to look for on a keyword search," Aaron explains in a video. He also thinks hopeful authors might be able to use the system to identify publishers who'd appreciate their style, using the system's analysis of the publisher's previous books. And he sees other potential advantages for readers. "Ultimately we could tell you don't give up on this book until you reach page 50 at least because then it's going to get a lot more action packed!" So far they've analyzed 207 books — though its mostly science fiction, listed alphabetically by the author's first name. There's seven by Isaac Asimov, and five more set in Isaac Asimov's fictional world, plus two books by Michael Crichton and two by L. Ron Hubbard. There's even three by James Doohan, who played Scotty the engineer on the original Star Trek. James Doohan's Privateer rates low on description. "We're late for Strong's meeting over at the Academy," Bret snapped. "Get up! We've got to leave right away." But the algorithm does give it a high rating for "action" (as well as pacing). Quent Miles looked at the other man, his black eyes gleaming coldly. "I'll get up when I'm ready," he said slowly. The two men glared at each other for a moment, and finally Brett lowered his eyes. Miles grinned and yawned again. If you liked The Privateer by James Doohan, BookLamp suggests eight other books — including Independent Command, by James Doohan. They've plotted 729,000 data points across 30,293 scenes, but there's one big problem: it still doesn't return enough matches. "There's no real way around this," Aaron acknowledges, "short of adding books to our database." He estimates that delivering comprehensive results would require a database of at least a million books. "Luckily for us, we live in a time when there are a number of such large scanning projects currently underway!" And his team is even thinking about building their own scanner. In the mean time, they've tucked a couple practical jokes into the system. Searching for George Orwell's 1984, the system returns a 98% match for the USA Patriot Act. The book's description? "A bad idea." A celebratory video touted the project's journey — a year of twice a week meetings for the five core team-members and 13 more working remotely. ("They worked in coffee shops and living rooms, via Skype and instant chat. They've become friends....") Though they'd originally aimed for an August prototype, it took about seven months longer. And yet it wasn't until last month that the three Boise developers met the other two core members, Matt Davenport from England and the mysterious Evan from Southern California. Dozens more programmers offered to help, the video notes. It's been a heady ride. Aaron began receiving thousands of emails a day after launching his video blog. When his father was hospitalized in November of 2006, "I realized that if I was going to do anything with my idea I couldn't put it off any more," Aaron says. But today he's at a crossroads. "So far, this project has been balanced against other things in our lives — we've been working on this in our own time, in our living rooms, normally after hours. And it's time for us to decide what we want to do with BookLamp." Microsoft still hasn't opened its doors, according to Aaron's blog. But there's still one glimmer of hope. Earlier this month he posted optimistically that "our presentation materials are still being bounced around Amazon.com. We've received word on Friday that our work is being positively received, and we should be cautiously optimistic. "Being one to celebrate whenever the opportunity arises, I immediately went out and bought myself a $1 fudge sundae from McDonald's. And Aaron now seems to be considering other less entrepreneurial options. He told a Boise newspaper that "It could be money driven, but when you run out of money it's over. Or it could be fun driven, and you never run out of fun." He's considering simply releasing the algorithm as an open source project, and he's asking for input from the online community that's been so supportive. "It's not quite a 'choose your own adventure' project," Aaron posts in the forum at BookLamp, "but your feedback will absolutely influence our decisions." And even if you don't like his idea, Aaron has a message for you: "thank you again to the thousands and thousands of people that have sent us good luck e-mails over this last year." He says their good will helped keep the project fun. At the end of the day, Google, Yahoo, and Amazon at least took a look at his idea. And even if he doesn't make any money — he's still getting a chance to make his dream come true. Closing Pandora's Box: The End of Internet Radio? Google Heard Me, Now What? Can America Handle a Little Truth?